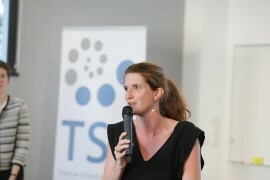 Last October, TSE welcomed the Young leaders of the French-American Foundation for an afternoon of exchange with TSE economists. 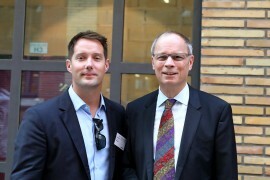 Nicolas Hazard, YL 2018, launched an interesting discussion with Jean Tirole on a range of topics, including the Digital Economy. This was followed by a debate on climate change with a talk by Christian Gollier, Scientific Director of the Energy and Climate Centre. Three young leaders drawn from a range of backgrounds and all very much concerned in their own way by climate change - Camille Lévy (from General Electric Power), Simon Tafoya (from the Office of Colorado Governor John Hickenlooper), Stéphanie de Bouard Rivoal (from Château Angelus) - also shared their own views and perspectives on this vital issue. The French-American Foundation works to reinforce transatlantic ties and to promote a constant dialogue between France and the USA. The Foundation’s flagship Young Leaders Program was established in 1981. 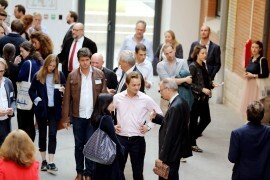 In this two-year program, alternating each year between France and the United States, groups of up-and-coming leaders (between 30 and 40 years of age)—in government, business, media, the military, and the cultural and non-profit sectors—spend five days discussing issues of common concern, meeting with local and global specialists, and getting to know one another. The Young Leaders’ visit to TSE follows on from the program of activities and events undertaken with American Friends of TSE to raise TSE’s profile in the USA. The links between TSE and the USA run deep and they are crucial to enriching research and education at TSE. More about Young Leaders here.